The struggle for a low carbon economy is political and economic. Last month, Kinder Morgan stopped all non-essential spending on the Trans Mountain pipeline expansion project and said it wants assurances by the end of May in order to proceed. They are demanding that two conditions be met by May 31. The two conditions are: final clarity on its ability to construct the project through B.C. and adequate protection of KML shareholders. · The current NDP BC Government of Premier Horgan ran on a promise to stop the project arguing it is not in the public interest. 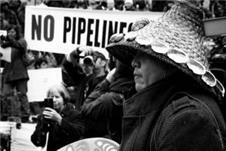 · Aboriginal people hold the underlying title to land that the pipeline expansion will be crossing — so many feel their approval is needed, not the federal or provincial governments'. The Aboriginal people’s opposition is backed by the recognition of Aboriginal title by the Canadian constitution and over 150 court decisions. · The City of Vancouver is against the increased tanker traffic and oil spill danger in Burrard Inlet; and the City of Burnaby is against the hazard to residents and community of more than doubling the tank farms on Burnaby Mountain. · We need to focus on renewable energy and move off fossil fuel dependency. Even Saudi Arabia has invested in the largest global solar energy project. Carbon, if released into the atmosphere, will heat the planet. We cannot afford more global warming. There are more long-term jobs based on a green economy than would be gained by the pipeline expansion. There are many articles and editorials on the Kinder Morgan May 31 deadline. Here are a few that are noteworthy.